In a recent survey conducted by Master Builders South Africa, 41% of respondents indicated that the foreman was the most critical skill lacking in the building industry. Master Builders KwaZulu-Natal seeks to address this by drawing the attention of members to the existence of an intervention to address this critical shortfall. For more information on foreman training click here. Benjamin Franklin famously said that there are only two certainties in life, death and taxes, and while paying tax is a legal obligation as well as a patriotic duty, thankfully there is no law that says we have to enjoy doing it, otherwise we would all be in trouble. The tax burden does for the most feel overwhelming. If you’re a salary earner, you spend four months of the year working for the receiver. If you’re a successful business owner, you are taxed on your profits and if you happen to make money on the stock exchange, you will have to pay capital gains tax. Then there’s also VAT to consider, perks tax and so it goes on. It may be comforting to know that this is not unique to South Africa and in other parts of the world people too get discouraged at having to fork out their hard earned money. Spanish musician Jose Maria Bejarano disheartened by his government’s tax policies, found a novel way of getting his message across. Mr Bejerano a musician turned promoter became disillusioned with the ruling PP party over their austerity measures. He felt let down when they introduced public spending cuts and tax hikes that directly harmed his business, like raising VAT on cultural events to 21 per cent. With outstanding debts for failing to pay his taxes and social security payments, the musician was declared insolvent. 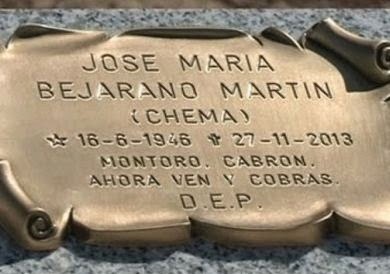 A photograph of the epitaph went viral on Spanish social networking and Mercedes Josefa de Castro (mayor of San Pedro de Latarce where Bejerano had lived), said the epitaph had sparked a “mini revolution” in the town. “Personally, it is not how I would chose to make a protest, but each person is free to express themselves in their own way in a democracy,” said the mayor.